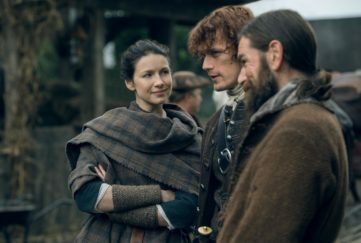 Of all the performers who got their big break with Outlander, there’s a subset of the cast that has been putting on the drama longer than all the others combined – the Outlander castles! Able to effortlessly create an atmosphere of wonder, menace, awe or peril as needed, they have captured the imaginations of legions of fans and are positively inundated with outpourings of fandom. I am talking, of course, about the castles, forts and palaces of Outlander. Doune Castle, which plays the leading role of Castle Leoch, is the most famous of this band of castellated characters but far from the only one. 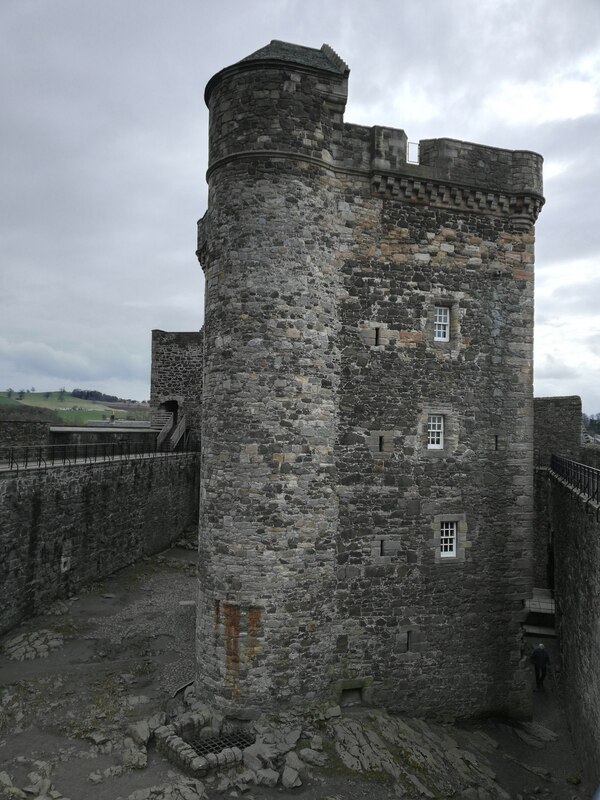 On our #ScotsMagOutlander adventure of April 7-8, Katrina Patrick and I got to meet many of the others, from a method-acting castle disguised as a battleship to a young gun standing on the shoulders of an old veteran. Let’s meet some of the cast! Many stars have been in the ascendant due to Outlander, yet there is probably no better example of a castle going from an unknown to a global superstar than Midhope Castle. Located just a few minutes’ drive from Blackness Castle, Midhope played the coveted role of Lallybroch. 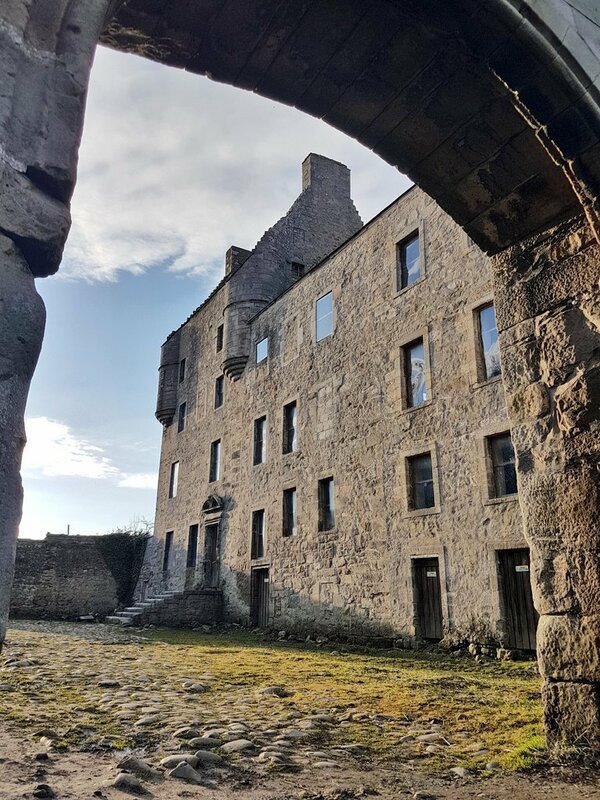 It made such an impact that the lines between the real castle and fictional home have become blurred – if you look at most online maps of the area, Midhope Castle is labelled as Lallybroch! Now that’s dedication to a performance. Midhope is something of an inscrutable actor, however, with no interior access possible, meaning fans have to use their imaginations when paying it a visit. Perhaps more than any other castle cast in Outlander Midhope values its privacy. The next site on the list, however, has never shied away from the glitz and glamour that comes with celebrity. having been built by James IV and James V as a Renaissance retreat. It was also the birthplace of that quintessential tragic heroine, Mary, Queen of Scots. Swans swim in the loch below and the setting has an unmistakable air of majesty. 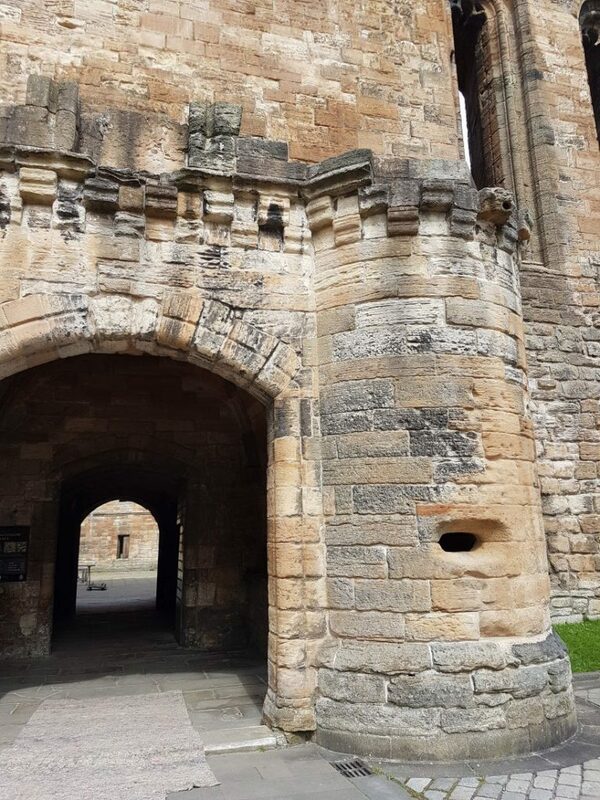 You’d expect Linlithgow Palace to refuse all but the most haughty of television roles. In the case of Outlander, however, it took a radical step in the opposite direction, with several of its chambers serving as the dank, dark prison cells of Wentworth Prison. Gross-out humour is also in its repertoire. Do you remember the scene where Claire throws up? That was at the entrance to this palace! Full points to Linlithgow for going gritty! Built after the 1715 Jacobite Rising as a government base to keep the Highlands in line, Ruthven Barracks is like the real gangster hanging out on the set of a mob movie. In February 1746, the Jacobite army forced the Government garrison out of the barracks, and burned the barracks down. On the day after the fateful Battle of Culloden, they regrouped here, and received orders to ‘seek their own safety. Prince Charles was already on the run. The fort stands on the site of a medieval castle built by the powerful Comyn family in the 1400s. It sits atop a huge, natural mound left over from when the glaciers retreated across Scotland some 12,000 years ago. 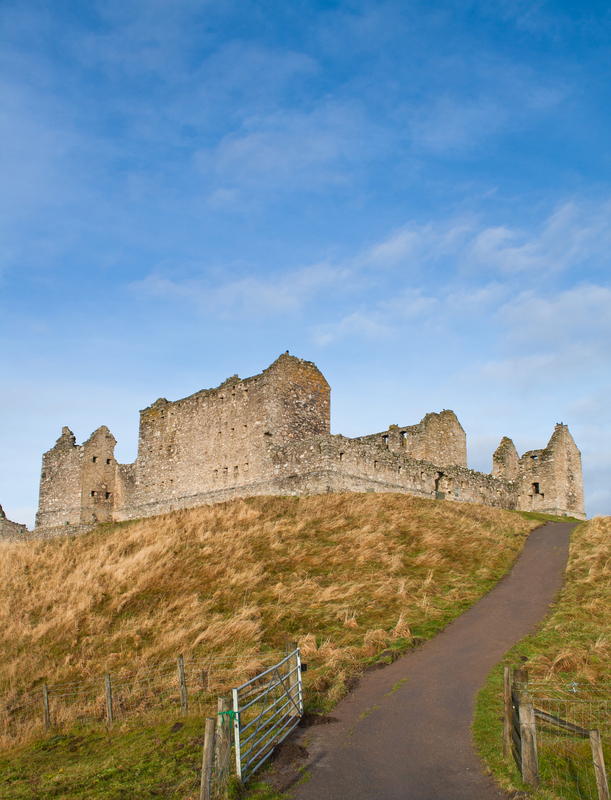 While Ruthven Barracks didn’t appear in Outlander, we can imagine it serving as historical advisor to the other castles like Blackness who wanted to recreate the atmosphere of an 18th century fort. 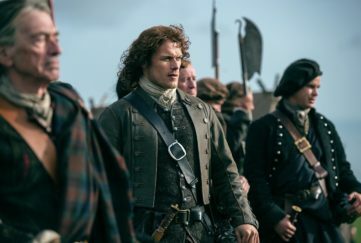 Blackness Castle was not built for anyone’s comfort, let alone that of Jamie Fraser. Of all the Outlander castles we visited this is the one that most fully embodies the philosophy of the ‘sod off’ castle. As soon as you see it, it’s fairly clear what the message is to anyone foolish enough to attack it. It bristles with gun loops and with sections of wall more than five metres thick. Blackness Castle was born to play the brutal role of Fort William where Jamie is mercilessly flogged in season one. 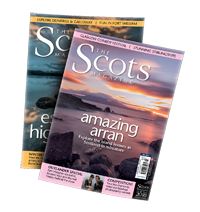 We got a shock of our own at Blackness – Diana Gabaldon herself was tuning in to our live broadcasts! She went on to share several the campaign’s live videos. This meant we, quite ironically, left the grimmest stop on our tour with ear-to-ear smiles of the sort that few, if any, of the castle’s residents would ever have displayed. You can see all the places we visited on our #ScotsMagOutlander adventure – including several other Outlander castles! 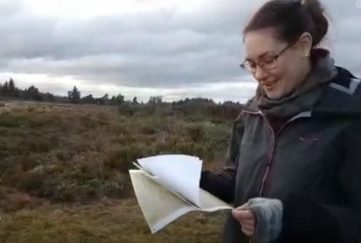 – by watching the live videos we shot at each site on my blog here and, of course, right here by browsing the ScotsMagOutlander homepage.